A total of 29 sculptures[note 1] have appeared since 1863 in New York City's 843-acre (3.41 km2) Central Park. Most have been donated by individuals or organizations, few by the city itself. 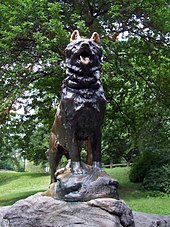 While many early statues are of authors and poets along "Literary Walk" and American figures like Daniel Webster and "the Pilgrim", other early works were simply picturesque, like The Hunter and The Falconer; other notable statues include sled dog Balto, the so-called "Cleopatra's Needle"—an Egyptian obelisk—Alice of Wonderland, and most recently Duke Ellington. Eagles and Prey, designed and created by Christophe Fratin, is the oldest known sculpture in any New York City park. It is made of bronze, and was cast in Paris, France in 1850 and was placed in the park in 1863. The sculpture was donated by Gordon Webster Burnham, who also donated the statue of Daniel Webster, as well as statues in other cities. The monument depicts a goat, wedged accidentally between two rocks, which is about to be devoured by two eagles. Their talons are sunk into the back of the goat as they flap their wings in victory. Still Hunt by sculptor Edward Kemeys (1843–1907) was placed in the park in 1883. This bronze sculpture of a crouching cougar waiting to pounce, was created by Edward Kemeys, the famous American sculptor who also created the famous Hudson Bay wolves at the Philadelphia Zoo, and lions at the entrance to the Art Institute of Chicago. Situated on a rock outcrop on the west side of the East Drive at the edge of the Ramble, the crouching animal has scared many joggers as they climb "Cat Hill" (formally Cedar Hill) and approach this life-size and realistic representation. Unlike the traditional sculptures of other animals in the park that sit on a base or pedestal, Kemeys situated his animal directly on the rock ledge. Kemeys was so interested in depicting his animals in a realistic mode that he traveled to the western states to see them in their native habitat. Bust of the architect Richard Morris Hunt at the Hunt Memorial, along with two other figures sculpted by Daniel Chester French. Flanking the Hunt bust are statuettes, one holding a sculptor's mallet and a palette, representing the allied arts, while the other holds a model for the Administration Building at the Chicago World's Columbian Exposition, designed by Hunt. On the perimeter wall of Central Park, Fifth Avenue and 70th Street, opposite the Frick Collection, which was built on the site of the Lenox Library, also designed by architect Hunt. The granite and marble Hunt memorial was designed by American architect Bruce Price. • Tucked into a dead end triangle of Central Park at east 96/97th, the statue of Albert Bertel Thorvaldsen was first dedicated in 1894 and is the only statue of an artist displayed in any New York City park. The Burnett Memorial Fountain, dedicated to the author Frances Hodgson Burnett, was placed in the Conservatory Garden when it reopened in 1936, a donation by the ad hoc Children's Garden Building Committee. It was designed and created by Bessie Potter Vonnoh between 1926 and 1936. When Frances Hodgson Burnett died in 1924, some of her friends wanted to honor her memory by creating a storytelling area in Central Park. They chose the Conservatory Garden's south garden, at 104th Street and Fifth Avenue, as the site for the memorial. It is believed that the two figures, a reclining boy playing the flute and the young girl holding the bowl, represent Mary and Dickon, the main characters from The Secret Garden. The equestrian sculpture of Simón Bolívar was originally sited on the rock outcropping between 82nd and 83rd Streets overlooking Central Park West, where the Bolívar Hotel, once facing it, commemorates its location. After Sixth Avenue was renamed Avenue of the Americas in 1945, the sculpture was relocated in the 1950s to be adjacent to those of fellow Latin American revolutionary leaders José de San Martín and José Martí at the head of the Avenue of the Americas. In 1892, Christopher Columbus was donated to Central Park by the New York Genealogical and Biographical Society in commemoration of the 400th anniversary of his arrival in the Americas. The statue replicates one made by Jeronimo Suñol in 1892, located at the Plaza de Colon, in Madrid. The New York version was placed in the park in 1894 at the foot of the Mall, and is today one of two monuments of Columbus found in the park's environs, the other being the statue surmounting the column at Columbus Circle. The sculpture depicts the explorer standing with outstretched arms, looking towards the heavens in gratitude for his successful voyage. The standing sculpture of Alexander Hamilton standing in a grove of apple trees and crabapples west of the East Drive behind the Metropolitan Museum of Art was "presented by John C. Hamilton 1880", according to the inscription on its granite base. The donor was the son of Hamilton. It was sculpted by Carl Conrads. The King Jagiello Monument is an equestrian statue of King Władysław II Jagiełło of Poland, holding over his head two crossed swords, is the largest sculpture in Central Park. As a result of the outbreak of the World War II, the monument stayed in New York; in July 1945 it was presented to the City of New York by the King Jagiello Monument Committee and permanently placed in Central Park with the cooperation of the last pre-Communist consul of Poland in New York, Kazimierz Krasicki. The King Jagiełło monument is situated on the east side of the Turtle Pond, across from Belvedere Castle and southeast of the Great Lawn. The bronze standing figure of Daniel Webster by Thomas Ball stands on a high granite plinth at the confluence of two carriage drives near the foot of Strawberry Fields Memorial, at approximately 72nd Street. Ball had circulated many examples of statuettes of this model. The over-lifesize bronze, cast in Munich, was presented by Gordon W. Burnham in 1876. The plinth bears as a bronze legend Webster's famous phrases LIBERTY AND UNION, NOW AND FOREVER, ONE AND INSEPARABLE. . The bronze bust of naturalist Alexander von Humboldt by Gustav Blaeser (1813–1874) has stood since 1981 on a granite pedestal at Naturalists' Gate, 77th Street and Central Park West, opposite the corner of the American Museum of Natural History. The monument, donated by an ad hoc association of German-Americans, the Humboldt Memorial Association, was dedicated at its original location at 59th Street and Fifth Avenue on September 14, 1869. Blaeser, who knew Humboldt, was said to have worked in part from Humboldt's death mask. The bronze was cast by Georg Ferdinand Howaldt, Braunschweig. The 107th Infantry Memorial is dedicated to the men who served in the 107th New York Infantry Regiment, originally Seventh Regiment of New York, during World War I. The regiment was, as its name implies, stationed in New York, and consisted of males mainly from this region. In 1917, the National Guard's 7th New York Infantry Registry Division. While in France, they saw heavy action, and at the end of the war in November 1918, of the 3,700 men originally in the regiment, 580 men were killed and 1,487 wounded, with four of the regiment's soldiers being awarded the Medal of Honor. The memorial depicts seven men; the one to the far right carrying two Mills bombs, while supporting the wounded soldier next to him. To his right another infantryman (depicting Robert Russell Bennett, a 107 combat veteran who was asked by the artist to model for the statue along with 6 other actual 107 veterans of the Somme) rushes towards the enemy positions, while the helmet less squad leader and another soldier are approaching the enemy with bayonets fixed. To the far left, one soldier is holding a mortally wounded soldier, keeping him on his feet. The bronze memorial was donated by 7th-107th Memorial Committee, and was designed and sculpted by Karl Illava, who served in the 107th IR as a sergeant in World War I. The monument was first conceived about 1920, was made in 1926–1927 and was placed in the park and unveiled in 1927, near the perimeter wall at Fifth Avenue and 67th Street. Hans Christian Andersen, the famous Danish fairy-tale writer, his most notable work being "The Ugly Duckling". His statue features him sitting and reading to a stray duck. The 1956 work by sculptor Georg J. Lober was constructed with contributions from Danish and American schoolchildren. It was cast at Modern Art Foundry, Astoria, Queens, NY. Poet Robert Burns is sculpted in bronze by Sir John Steell, the eminent Victorian sculptor. It was unveiled in Central Park, New York in 1880. It was intended as a companion statue to Sir Walter Scott by the same sculptor, erected some eight years previously. Fitz-Greene Halleck has been described as the least known literary figure today on Literary Walk, despite being the only person to have a memorial unveiled by the then-president of the United States, Rutherford B. Hayes in 1877, ten years after his death in November 1867. The monument was funded by the use of public subscription, and had a long list of prominent guests and speakers at the dedication and unveiling of the monument, among them the president's cabinet, General of the Army William T.Sherman, the poets Bayard Taylor, George Henry Boker and William Cullen Bryant, as well as other notable citizens. The monument is made in bronze by James Wilson Alexander MacDonald, and is placed near the Literary Walk and The Mall. The monument has been thoroughly refurbished by The Central Park Conservancy, first by hot waxing it in 1983, and then again in 1992, as well as in 1999, when it was dewaxed, pressure-washed and repatinated, and then protected by a coating of a corrosion-inhibiting lacquer. William Shakespeare, a bronze statue on a stone pedestal, located to the south of the mall, southeast of Sheep's Meadow; this sculpture was erected with funds raised from a benefit performance of Shakespeare's Julius Caesar on November 25, 1864, at The Winter Garden Theatre, in a performance by Edwin Booth, Junius Brutus Booth, Jr. and their younger brother, John Wilkes Booth. John Quincy Adams Ward sculpted the work. Ward was arguably the dean of American sculpture at the time, and he is the source of more public sculpture in NYC than any other artist. This is the artist's second of four works in Central Park. The Angel of the Waters / Bethesda Fountain (unveiled in 1873) was not in the original "Greensward Plan", developed by Frederick Law Olmsted and Calvert Vaux; the architectural middle of the park was called "The Water Terrace", for its placement beside The Lake, but the area became known as Bethesda Terrace after the fountain was unveiled in 1873. At the unveiling ceremony, the artist's brochure quoted a Biblical verse from the Gospel of St. John: Now there is at Jerusalem by the sheep market a pool, which is called… Bethesda…whoever then first after the troubling of the waters stepped in was made whole of whatsoever disease he had. The fountain was designed and created by Emma Stebbins, who became the first woman to receive a sculptural commission in New York City when she was commissioned to create this fountain. It was designed and created in 1868, but wasn't unveiled until 1873, when the park was officially completed. In 1988. the Central Park Conservancy cleaned, repatinated, and sealed the fountain with a protective coating, and it is washed and waxed annually in order to preserve it. The fountain can be found in the middle of the park, on the north side of 72nd Street. Indian Hunter (1866) by John Quincy Adams Ward was shown at the Paris Universal Exposition of 1867 and made the sculptor's reputation. It was the first sculpture by an American sculptor to be sited in Central Park, in 1869; it stands on the pathway west of The Mall, between the Mall and Sheep Meadow, at approximately 66th Street. The Untermyer Fountain in Conservatory Garden was donated by the family of Samuel Untermyer in 1947. The bronze figures, Three Dancing Maidens by Walter Schott (1861–1938), were executed in Germany about 1910. In addition, temporary exhibitions of sculpture are mounted in the Doris Freedman Plaza, a concrete and cobblestone area located just outside the southeast entrance walkway to the park, behind the Sherman Monument. The fountain honors children's author Frances Hodgson Burnett, and features her characters, Mary and Dickon, from The Secret Garden (1910). 40°46′47″N 73°57′56″W﻿ / ﻿40.779638°N 73.965451°W﻿ / 40.779638; -73.965451﻿ (Cleopatra's Needle) Erected by Thutmose III at the Temple of Tum at Heliopolis. Carved 1500-1600 B.C. 40°46′25″N 73°58′20″W﻿ / ﻿40.773632°N 73.972120°W﻿ / 40.773632; -73.972120﻿ (S. Rankin Drew Marker) Unknown sculptor Installed 1928 76003488 Drew was a silent movie actor/director who died in World War I. The American Legion planted an oak tree in his memory in 1920, and installed the marker in 1928. 40°47′43″N 73°57′11″W﻿ / ﻿40.7951434°N 73.9529624°W﻿ / 40.7951434; -73.9529624﻿ (Fort Clinton (Central Park)) William Welles Bosworth, designer 1906 76002752 Fort Clinton was built during the War of 1812 as part of New York City's defenses, and was later demolished. A mortar (cannon barrel) was unearthed at the site in the early 1900s. Bosworth designed a pedestal for the mortar and a memorial plaque. Paul Manship, sculptor Installed 1932 76003511 There is a small sundial at the center of the bench. Installed 1945 87870164 The equestrian statue was cast for the Polish Pavilion at the 1939 New York World's Fair. 40°47′03″N 73°57′33″W﻿ / ﻿40.784064°N 73.959127°W﻿ / 40.784064; -73.959127﻿ (Fred Lebow Statue) Jesus Ygnacio Dominguez, sculptor Cast 1994 Lebow was a founder of the New York City Marathon, and ran in it until age 60. The posthumous statue was installed beside the Upper Reservoir Jogging Track in 2001, but each November it is moved near to the marathon's finish line. Cast c. 1979 Gift from the City of Hamburg, Germany. George Fischer & Brother, foundry 1878 87870169 William Cullen Bryant delivered an address at the sculpture's unveiling. Dedicated 1951 87870167 A copy after Louis Joseph Daumas's 1862 sculpture in Buenos Aires. 40°46′23″N 73°58′19″W﻿ / ﻿40.773194°N 73.971831°W﻿ / 40.773194; -73.971831﻿ (Friedrich von Schiller Memorial) Charles Ludwig Richter, sculptor Dedicated 1859 76003543 First sculpture installed in Central Park. Commemorates Mount St. Vincent Academy, a convent and school run by the Sisters of Charity of New York. The building was converted into a military hospital during the Civil War, and demolished in 1917. Dedicated 1920 76003551 Stead was a British journalist who died in the sinking of the RMS Titanic. This is a copy of the 1913 Stead Memorial in London. 40°46′33″N 73°58′31″W﻿ / ﻿40.775735°N 73.975205°W﻿ / 40.775735; -73.975205﻿ (Strawberry Fields (memorial)) Bruce Kelley, landscape architect Dedicated 1985 The "Imagine" mosaic was created by stone masons in Naples, Italy, who donated it to Central Park. Dedicated 1894 76003556 A bronze copy after the Danish sculptor's 1839 self-portrait (Thorvaldsen Museum, Copenhagen). Commissioned by the United Danes, Norwegians and Swedes of New York and Brooklyn to commemorate the 50th anniversary of Thorvaldsen's death. Schott's original fountain won a Gold Medal at the 1910 Brussels World's Fair. The awkward statue was removed by the 1890s. A proposed Bolívar statue by Giovanni Turini, to be placed on the same base, was rejected in 1897. The current Bolívar statue, by Sally James Farnham, was installed in 1921. Destroyed 1953 88100201 The marble drinking fountain was first installed in Union Square, where it was vandalized. It was moved to Central Park about 1898, but deteriorated, and was removed in 1953. Removed 2018 76003548 Sims used enslaved women for his gynecological research. The memorial became controversial in the 2000s when this became widely publicized. The statue was removed on April 17, 2018, and will be relocated to Green-Wood Cemetery in Brooklyn, where Sims is buried. Donated 1863 Kalide's Boy with Swan was placed in the Charlottenburg Palace Gardens in Berlin in 1849. 5th Avenue & 60th Street Paola Pivi, artist June 20 - July 18, 2012 The Piper Seneca would slowly rotate head-over-tail. YouTube video. ^ With the monuments erected against the park's outer walls, the total of sculptures in the care of the Central Park Conservancy is described as "over fifty". ^ "King Jagiello Monument". Central Park Conservancy. Retrieved June 17, 2014. ^ "Daniel Webster". Central Park Conservancy. Archived from the original on March 10, 2014. Retrieved June 17, 2014. ^ "Hans Christian Andersen". Central Park Conservancy. Retrieved June 17, 2014. ^ "Indian Hunter". Central Park Conservancy. Retrieved June 17, 2014. ^ "The Untermyer Fountain". Central Park Conservancy. Retrieved June 17, 2014. ^ "Duke Ellington Memorial dedicated in Harlem," from ArtNet. ^ "Tablet is unveiled at old Fort Clinton," The New York Times, November 25, 1906. ^ "The Lost Auld Lang Syne Sculpture in Central Park," Daytonian in Manhattan, June 18, 2012. ^ Michael Reed, "The Equestrian Monument of Simon Bolivar." ^ Shepard Fountain, from SIRIS. ^ The Boy with Swan, from Christies London. ^ Carol Vogel, "The Murakami Influence," The New York Times, April 6, 2005. ^ Rich Calder, "Shoddy work cut short Central Park art exhibit: suit," The New York Post, October 18, 2013. Wikimedia Commons has media related to Sculptures in Central Park. ALICE IN CENTRAL PARK — STATUES IN WONDERLAND by G.A. Mudge, visual reference of the statues in central park, with historical comments.